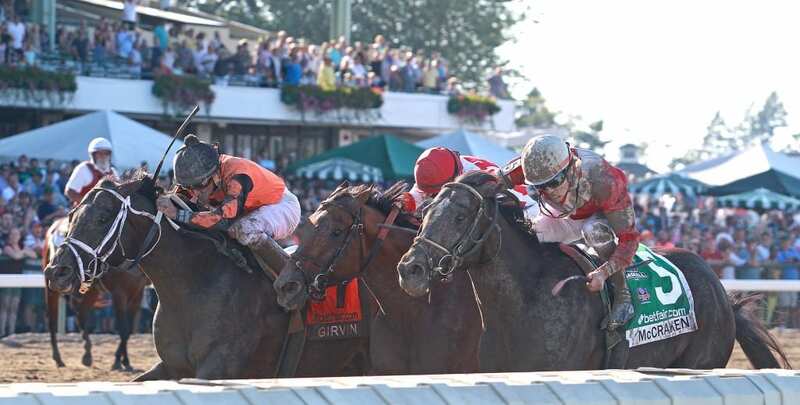 Three-way thriller in the 2017 Haskell went to Girvin. Photo By Bill Denver/EQUI-PHOTO. Forty-four 3-year-olds were extended invitations Friday to the $1 million betfair.com Haskell Invitational on Sunday, July 29, at Monmouth Park, with juvenile champion Good Magic heading the list of potential starters in the Grade 1 race. Trained by Chad Brown, Good Magic was the runner-up in the Kentucky Derby. Last year he burst onto the national scene when he captured the Breeders’ Cup Juvenile breaking his maiden in that Grade 1 event en route to his Eclipse Award. Brown will be seeking his first victory in the Haskell Invitational, the track’s showcase event that is contested at a mile and an eighth.